Chiin Nei Chinga, Mansi Parihara, R. Sudhakaranb* aSchool of Bioscience and Technology, VIT University, Vellore – 632 014, Tamil Nadu, India. *bAssistant professor, SBST, VIT University, Vellore – 632 014, Tamil Nadu, India. Aquaculture is the farming of aquatic organisms such as fish, crustaceans, molluscs and aquatic plants. Disease emergence is a concern in wild fisheries due to environmental pressures, the direct impact of human activities and the risk of pathogens spread from aquaculture. Common viruses are Taura syndrome virus (TSV), white spot syndrome virus (WSSV), and the necrotizing hepato pancreatitis bacterium (NHP-B). The White Spot Syndrome Virus is the most economically devastating viral pathogen to global shrimp aquaculture production and has been proposed to be capable of infecting all decapod crustaceans. WSSV is an enveloped ellipsoid virus, which belongs to the genus Whispovirus of the family Nimaviridae. VP28 is one of its major envelope proteins, and plays a crucial role in viral infection. In this study, the proteins of the infected crab were purified using SDS page and then Western Blotting was performed to extract that particular protein. The VP28 protein will appear as specific bands in the blot. Keywords: Aquaculture, White spot syndrome virus, VP28, SDS-Page, Western blotting. White spot syndrome virus (WSSV) is one of the major shrimp pathogen that causes a high mortality rate of 90-100% within 3-10 days of infection (Lightner, 1996). Natural WSSV infections have been found in captured and cultured specimens of the mud crab. WSSV is an enveloped ellipsoid virus, which belongs to the genus Whispovirus of the family Nimaviridae. In addition, WSSV can also infect a wide range of hosts including both decapod and non-decapod animals with more than hundred species described to date. So far, the genome from three different WSSV isolates has been sequenced. Sequence analysis showed that WSSV contains approximately 500 putative open reading frames (ORFs), most of which have no homology with any known genes or proteins in public databases. Till now, more than 50 structural and non-structural proteins were identified. Tools such as polymerase chain reaction (PCR) and nested PCR, originally developed by Lo etal., have been widely used and recommended by the Office of International Epizootics (OIE) to be used as standard diagnostic methods for the detection of WSSV. Despite their excellence in specificity and sensitivity, these methods were not suited in some circumstances due to their complications, the requirement of thermal cycler, time-consuming, and labor-intensive. Moreover, the classical agarose gel electrophoresis with ethidium bromide staining, following the visualization under the ultraviolet (UV) transilluminator required to analyze the result of PCR products. Western blotting identifies with specific antibodies proteins that have been separated from one another according to their size by gel electrophoresis. The blot is a membrane of nitrocellulose or PVDF (polyvinylidene fluoride). The gel is placed next to the membrane and application of an electrical current induces the proteins in the gel to move to the membrane where they adhere. The membrane is then a replica of the gel’s protein pattern, and is subsequently stained with an antibody. Therefore, these features could be limited their applications, particularly in the resource-limited areas and non-laboratory environments such as at the pond or station sites. Gills, muscle, hepato pancreas and Head soft tissue from the crab infected with WSSV were homogenized in 1:10 suspension with NTE Buffer. It was then freeze and thaw for three times then centrifuged at 5000 rpm for 5min. The supernatant were collected separately in a tube and stored at -20°C. This supernatant was used for protein analysis. Lowry’s method was performed for the estimation of protein in order to know its concentrations (Lowry et al., 1951). Working standard- diluted 1ml of stock solution to 5 ml with distilled water. (200 µg of protein/ml). SDS-PAGE is currently used to determine the molecular masses, and also to investigate the subunit composition and the domain structure of proteins. TAE Buffer (1X) was poured in tank which maintain the temperature and pH of the gel. Gel was prepared and protein sample is mixed with bromophenol blue which act as a tracking dye. Then it was loaded into the well and electric current of 50V is applied into the tank which is later on increase to 100V when the dye contacts the resolving gel. When the dye reach the end of the resolving gel it was taken out and stain with the help of Coomassie Brilliant Blue R-250 (methanol-50 ml, distilled water 40 ml, glacial acetic acid 10 ml) for 1 hour and de-stain the gel by immersing in the de-staining solution (65 ml of distilled water, methanol 10 ml and 25 ml of glacial acetic acid). The membrane can be either nitrocellulose or PVDF. PVDF requires activation with methanol for one minute and is then rinsed with transfer buffer before preparing the stack. After stacking, the electro transfer is carried out for 90 minutes at a constant current of 150 mA set by maintaining the voltage at maximum. Transfer to the membrane and checked using Ponceau Red staining before the blocking step. (PVDF cannot be stained). After ponceau staining, wash the nitrocellulose membrane with TBST for 1 min at room temperature. Block the membrane for 1 hour at room temperature in blocking buffer (10 % milk in TBST). After blocking, incubate the membrane in primary antibody (1:1000 dilutions) in 2.5% milk in TBST overnight at 4°C. Wash the membrane for three washes using TBST for 5 minutes each. Incubate the membrane with secondary antibody (1:2000 dilutions) in 2.5% milk in TBST at room temperature for 1 hour. Wash the membrane in three washes of TBST, 5 minutes each. Add ECL reagent (Solution A and B in 1:1 ratio) on to the membrane and spread it thoroughly on to it using a pipette. Remove the excess reagent and place the membrane on to the x-ray cassette and expose to x ray film in the dark room. An initial 10 sec exposure should indicate the proper exposure time because due to the kinetics of the detection reaction, signal is most intense immediately following incubation and declines over the following 2 hrs. Fig.1 SDS-PAGE which shows different bands under white light. Lane 1- Gill; Lane 2- HST; Lane 3- Muscle; Lane 4-Hepatopancreas. The polypeptides of purified virus were resolved by SDS-PAGE using discontinuous buffer system. 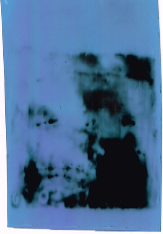 In 12.5% acrylamide gel, the purified virus yielded different polypeptides base on their molecular mass in which lower molecular weight will elute faster as compared to those having higher molecular weight, which were Visualized on Coomassie brilliant blue R 250 staining. By performing SDS-PAGE, (fig.1) we can determined the different molecular weight of polypeptide. The difference in the number of the polypeptide may be attributing due to the difference in concentration of the resolving and other physical conditions. 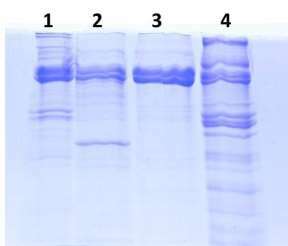 The western blot analysis of proteins of semi-purified white spot syndrome virus separated on 12.5% gel (fig.2) showed different number of immunogenic proteins based on its molecular weight. Out of these, those proteins, which stained more intensely, were considered as major immunogenic proteins. However, further studies are needed to establish its immunogenic nature and feasibility for its use as vaccine. Because electrophoretic separation of proteins is always carried out under denaturing conditions, the problem of solublization, aggregation and co-precipitation of target proteins with adventitious proteins are eliminated. Lowry, O. H., N. J. Rosebrough, A. L. Farr and R. J. Randall (1951): Protein measurement with the Folin phenol reagent. J. Biol. Chem., 193(1), 265-275.
 van Hulten, M. C., J. Witteveldt, S. Peters, N. Kloosterboer, R. Tarchini, M. Fiers, H. Sandbrink, R. K. Lankhorst and J. M. Vlak (2001): The white spot syndrome virus DNA genome sequence. Virology, 286(1), 7-22. Seetang-Nun Y, Jaroenram W, Sriurairatana S, Suebsing R, Kiatpathomchai W (2013)­: Visual detection of white spot syndrome virus using DNA-functionalized gold nanoparticles as probes combined with loop-mediated isothermal amplification. Mol Cell Probes, 27(2):71-9. Maurice Pagano (1999): Application of electrophoresis and related methods, such as western blotting and zymography to the study of some proteins and enzymes. Analytica Chimica Acta, 83(1–2): 119–125. Lightner, D. V. (1996): A Handbook of Shrimp Pathology and Diagnostic Procedures for Diseases of Cultured Penaeid Shrimp. World Aquaculture Society. "Analysis of VP28 Gene in White Spot Syndrome Virus Infection." UKEssays.com. 11 2018. All Answers Ltd. 04 2019 <https://www.ukessays.com/essays/biology/analysis-vp28-gene-white-spot-syndrome-virus-1858.php?vref=1>. "Analysis of VP28 Gene in White Spot Syndrome Virus Infection." All Answers Ltd. ukessays.com, November 2018. Web. 23 April 2019. <https://www.ukessays.com/essays/biology/analysis-vp28-gene-white-spot-syndrome-virus-1858.php?vref=1>. UKEssays. November 2018. Analysis of VP28 Gene in White Spot Syndrome Virus Infection. [online]. Available from: https://www.ukessays.com/essays/biology/analysis-vp28-gene-white-spot-syndrome-virus-1858.php?vref=1 [Accessed 23 April 2019]. UKEssays. Analysis of VP28 Gene in White Spot Syndrome Virus Infection [Internet]. November 2018. [Accessed 23 April 2019]; Available from: https://www.ukessays.com/essays/biology/analysis-vp28-gene-white-spot-syndrome-virus-1858.php?vref=1.